One of the major annoyance in Windows 10 is that you cannot control, adjust or change the volume of individual modern UWP apps downloaded and installed via Windows Store (now known as Microsoft Store) in Volume Mixer. In fact, these modern (Metro) Windows Store apps do not even show up in Volume Mixer. The only way to turn up or turn down or mute the sound volume level of Windows Store UWP apps is by adjusting the master volume. This is in contrast to desktop apps, where each and every desktop apps appear in Volume Mixer, and users can adjust or mute the volume individually. 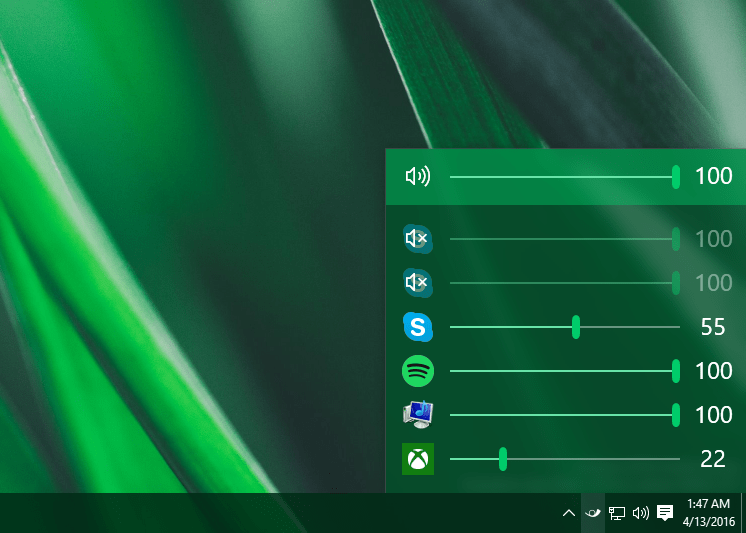 Just imagine if you have multiple applications that produce sound, such as Netflix, Spotify, Facebook, YouTube, Kodi, Plex, games and various web browsers, and you can only mute the master volume if you want to temporarily mute the sound or music from UWP apps (such as Edge and Groove Music) to listen to sound from desktop app or game. This tutorial shows how you can make Volume Mixer control of Windows 10 to be available for modern UWP Store apps too. 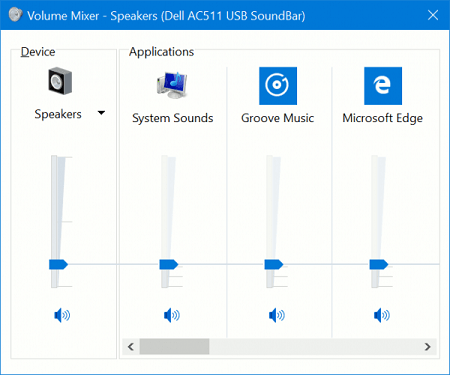 Microsoft updated the Volume Mixer in Windows 10 Fall Creators Update v.1709 (more specifically since Windows 10 Build 16193) to now include UWP apps, so that users can set the volume of apps individually without impacting the overall system volume. In Windows 10 Fall Creators Update v.1709, open the Volume Mixer by right clicking on the Speaker icon on the Taskbar’s notification area (system tray) and select Open Volume Mixer; or run the sndvol command. UWP apps will only appear in the Volume Mixer once they start playing sound. If you’re not upgrading to Windows 10 version 1709 yet, you can download and install EarTrumpet from GitHub. EarTrumpet allows control of volume of all apps independently, both desktop and universal store apps. After installing Ear Trumpet, a trumpet icon will appear in the system tray. Click or tap on it to bring up ahd volume control to adjust he sound of individual applications for the modern apps. As EarTrumpet is an individual application, it’s possible to use it in parallel with Windows 10 built in Volume Mixer for greater control.